This past week, I traveled to Kuala Lumpur, Malaysia to renew my non-immigrant visa at the Royal Thai Embassy. While there, I had a chance to visit with some friends and also to stop at the Islamic Arts Museum, something that has been on my to-see list since I first went to KL a few years ago. The Islamic Arts Museum is located in a large park not far from the central train station. It is surrounded by expressways, though, making it very difficult to reach on foot. The museum is just up the street from the National Mosque, a beautiful blue-roofed complex that is worth a visit. The collection is not as well-curated as I had hoped, although it covers a diverse range of subjects from architecture to textiles, ceramics to metals. Also, the collection represents all the major cultures in the Islamic world from Africa to the Middle East to India to Southeast and East Asia. Here is a selection of some of the pieces I saw. There was a large selection of beautiful Quran. 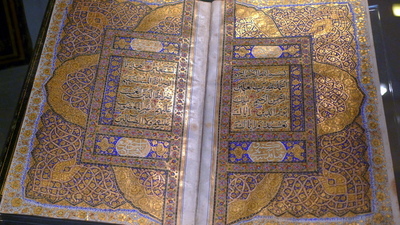 This book is the central religious text for Muslims and there is a wonderful tradition of hand-painting copies of the text, complete with exquisite illustrations, calligraphy, and gold-leaf decorations. 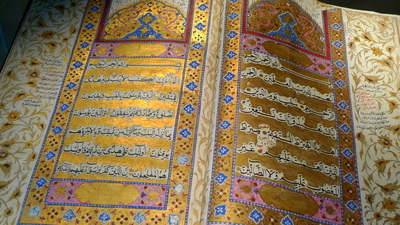 The exhibit also explained the different fonts of calligraphy – Arabic and otherwise – used in the displayed Quran. The scripts are beautiful, written from right to left, some highly stylized and others with more distinct characters. 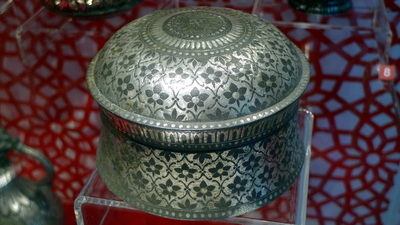 There were many examples of fine metal working, especially silver. My understanding is that Islamic art generally avoids representations of humans or animals and so there is a lot of emphasis on geometric patterns (which represent the perfection of creation) and floral patterns. There were many ceramic pieces. Blue seems to be a popular color and this turquoise glazed three-legged pot was practically glowing, the color was so vibrant. If you look closely (sorry, hard to see clearly through the glass), there is stylized calligraphic script around the top band of the pot. 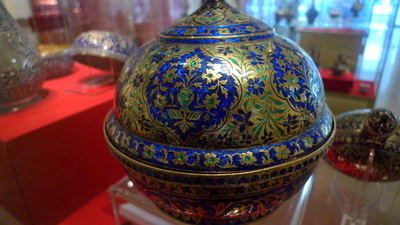 This example of cloisonné, metalwork decorated with enamel. Very fine detail and, again, very vibrant colors. 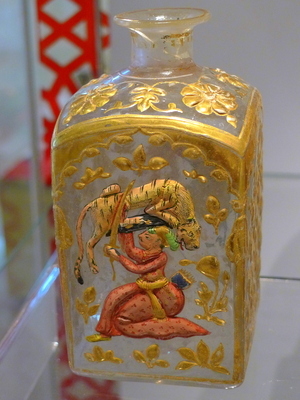 This piece, a painted glass bottle, is one of the few exceptions I found to the “no people, no animals” prohibition. A little bit of research while writing this entry and I discovered that this type of restriction is known as aniconism. New word for the day. The final piece I want to share with you is this finely sculpted chess set. The detail was amazing and I can only imagine the pressure the craftsman must have felt to not make a mistake and waste all the hard work completed so far. I hope you enjoyed the selection of pieces from the museum. Sorry for not posting more while on the road. I’ve found the Xanga site to be uncooperative in the past few weeks, often freezing while a page is loading. This entry was posted in Uncategorized and tagged art, arts, culture, islam, islamic, kl, kualalumpur, malaysia, museum, muslim by christao408. Bookmark the permalink. So you are back in Bangkok? Nice short stop in KL. These are absolutely beautiful and TD loves the chess set. I love the blue and gold designs. You do have a keen eye for the colorful objects! What a nice visa run you had! @stevew918 – Yes, returned Thursday evening. And was back for several weeks between the US and KL trips but my delays in writing some entries may make it look like I went directly from one trip to the next. @agmhkg – If I understand, the only strict part of the rule is no images of Allah or Mohammed. From there, images of other important people in the religion are severely frowned up, and then images of general people and animals are discouraged. @CurryPuffy – It was an okay trip. A little boring, actually, because I didn’t want to spend a lot of time outside in the hot weather. @n_e_i_l – Most of the works I photographed are less than 200 years old, so I’m sure the geometric theories were well known by then. As for the prohibitions on human/animal depictions, it isn’t the Quran that prohibits but rather other religious texts that were written. 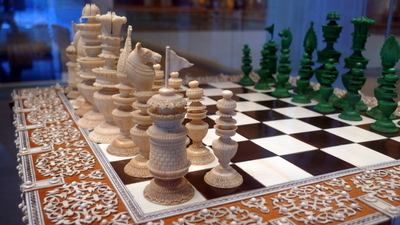 @Grannys_Place – Wish the gift shop had sold replicas of the chess set! I have always been amazed by the detail that the artists wereableto accomplish – being a chess player you know I want the chess set. Pretty colours all over! I had no idea such a place existed there, so I’m really glad you shared this experience with us. And it’s really good that I got reminded of that rule regarding drawing humans and animals– truly appreciated. Amazing craftsmanship! I’m amazed at the chess board and pieces – what are the green pieces made of? Jade? Malachite? Thank you for this post Chris. I loved reading it and seeing your pictures. 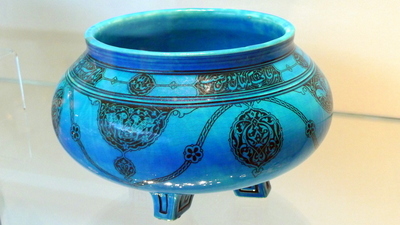 The picture with the turquoise three legged bowl is typical of Iranian art. The writing at the top band is Farsi. I love the details and colour. I wonder if anyone ever played with that chess set. Islamic art is beautiful. These are wonderful pieces and of course, the Qurans. Today one can create complex geometrical art in programs like Illustrator and Photoshop. It’s amazing people were able to do these by hand. If I didn’t break the word aniconism down I would not have remembered it.The little side picture we use here at xanga is our icon which some Islamic folks refuse to use at times.The Christian Church sort of remembers the ten commandment and take the interpretation of not making a graven image seriously in some sects of christianity. I believe that Abraham was not in favor of making graven images because that’s what his father did for a living! @christao408 – No, that’s what I mean—the math that properly describes it is even more recent than that. So however it was done, it was probably not by that particular route, although obviously it amounts to the same thing. Ditto for Celtic interlace and similar stuff. You really got to admire the ingenuity of those artisans! @fabolousclown – Thanks for recommending the entry. @n_e_i_l – Ah, got it! @Gma_Joyce – That gene sounds familiar! @PPhilip – Interesting – never thought about a profile picture being akin to creating an image of a living being. @TheSutraDude – Thanks for the recommendation. Yes, the fact that these complex designs were done by hand makes them all the more amazing. No software programs to assist! @ElusiveWords – Can you imagine playing with such an intricate set? @ZSA_MD – There you go – thank you for clarifying. I was not careful to take notes or photos of the descriptive cards, so ended up not remember all the details. Thanks, too, for recommending this. @murisopsis – Good question. I wanted to write that in the caption but, as I mentioned to Dr. Zakiah above, I was remiss in not documenting the details. I would assume some sort of jadeite or maybe malachite. @nov_way – Glad you enjoyed it. Funnily enough, there were “no photography” signs all over the museum, but everyone else was taking pictures so I decided to do so, too. @Fatcat723 – It would be quite an item for your collection, no? Beautiful artwork all around. Thanks for sharing it. This would certainly be a must-do destination on a trip to Kuala Lumpur. @jandsschultz – It sure would be, although I’m not sure I would put KL very high in the must-visit list. I’m not certain KL would be high on my list either, but searching out art from a variety of sources always is and I think art of the Muslim world is frequently not readily available or not thought about. Obviously there are beautiful works to see and understand. Surely there are other museums throughout the world that house/display works from Muslim artists/artisans. Oh I didn’t even know there was such a museum in KL. And to think that I am Malaysian! @icepearlz – You didn’t receive the memo? Actually, one of the taxi drivers described it to me as “one of the many white elephants here in Malaysia”…@jandsschultz – Supposed to be a great museum in Abu Dhabi, if I’m not mistaken. An extension of the Guggenheim and designed by Frank Gehry. i’ve been to KL so many times, yet never been to a single museum there. i guess living in indonesia for so many years prevents me from having an urge to visit a museum that displays similar cultural arts, which i may find at home. but i’m glad you did. those pieces look exquisite. @rudyhou – I can understand the reluctance and, all things considered, I wouldn’t include this museum super high on the list. Since I had been to KL several times, I finally ran out of other things to do. Ha ha!